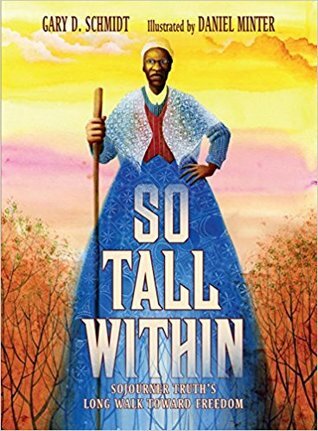 So Tall Within is a gorgeous picture book about the life of Sojourner Truth. The book combines the talents of writer, Gary D. Schmidt, and artist, Daniel Minter. The story follows the life of Isabella who is sold into slavery at age nine. After years of slavery, Isabella flees with her baby, Sophia, and lives with the Van Wagener family. 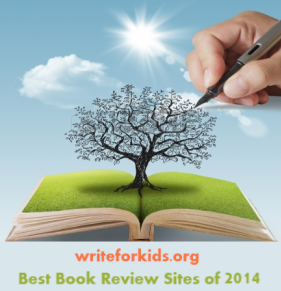 The narrative text is interspersed with powerful poems. Minter explains in the Artist's Note that he created vertical paintings to accompany the poems; the paintings reflect "the times of legal slavery" and also "parallel the feeling of struggle in today's streets." Throughout the book, the marriage of text and illustration is amazing. Muted, watercolor illustrations depict Isabella and her family in harsh conditions. One stunning page show silhouette in a tree as Isabella wonders if her descendants will also be slaves. The title of the book comes from a quote by Isabella as she tells her story to a Grand Jury in her effort to free her son, Peter, from slavery. Minter incorporates words from the Constitution into the background of illustration as Isabella stands tall in front of the jury. Fifteen years after escaping from slavery, Isabella changed her name to Sojourner Truth and spent years walking across the country sharing her story and speaking about slavery, women's rights, prisons and capital punishment. The final two-page spread shows Sojourner Truth in a bright blue dress looking up at the moon in a blue sky. Back matter includes an Artist's Note, a Biographical Notes and a detailed Bibliography. 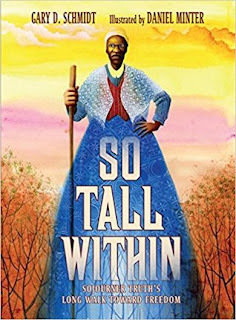 So Tall Within is highly recommended readers of all ages. It's one of the best nonfiction books I have read this year. 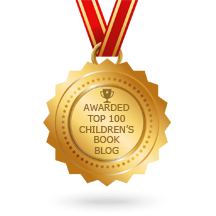 I would not be surprised to see if bring home multiple awards including a Caldecott, a Sibert and a Coretta Scott King Illustrator Award.